Suite Sports: College Football is (really) Back… Let's Gamble! College Football is (really) Back… Let's Gamble! 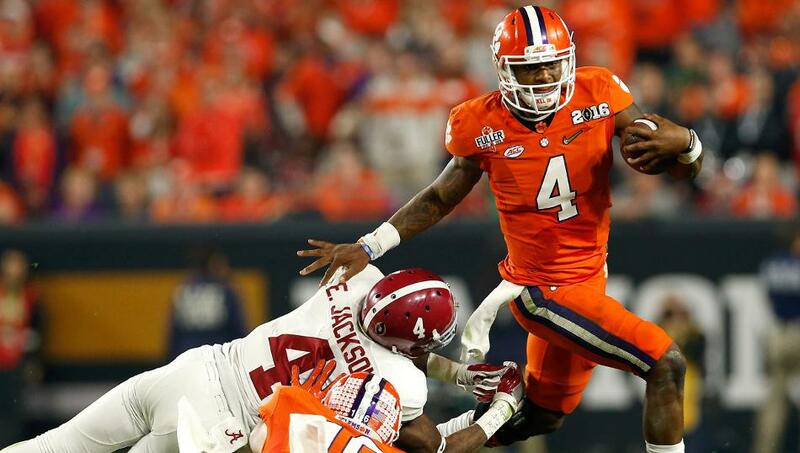 Deshaun Watson opens as one of the year as a favorite to win the Heisman, and his Clemson Tigers are expected to again contend for a national title. Ed. Note- Obviously, we do not condone illegal gambling. Only place bets at legitimate sports books (I had my sister throw down a little money for me when she was in Vegas for a conference), and only if you're of legal age. And yeah, don't, like, bet your life savings or rob people to make bets. This is for fun people. Oh, and I don't condone betting on high school sports, because placing money on unpaid athletes would be morally reprehensi... Ok, let's just get to the article. All due respect to Cal and Hawaii's trip to Australia, and yesterday's thrilling games featuring Appalachian State, Florida International and Vanderbilt (who all lost, somehow), but college football really returns Saturday. Yes, I know a trio of ranked teams will play tonight, and hey, Stanford had the decency to schedule a Power 5 opponent, but Saturday is when you'll really wish you were in Vegas, throwing your money away on a group of unpaid 18-22 year old young men you've never met. After all, betting on people who make millions of dollars is so passé. Just kidding, we're obviously betting on the NFL too this year, but college starts first, so let's dive right into our first college gambling piece of the year. Look, if you haven't made your futures bets yet, you're about to lose out on some great odds after Week 1. Inevitably, somebody like Florida State or Notre Dame will beat a (seemingly) good team, and suddenly money will pour in on them to win the national title. Heck, Florida State has already gone from 12/1 to 8/1 in most Vegas sports books. That's okay for Notre Dame, because the Irish are a sucker bet anyways (large, irrational fan bases with money tend to create sucker bets. See the Cowboys for an NFL parallel), but Florida State was a solid bet at current 12/1 (where I grabbed the Noles a few weeks ago). At 8/1… You kind of have to be Alabama to make good on those odds. Still, the Seminoles return stud running back Dalvin Cook and have recruited as well as anyone this side of Tuscaloosa the past few years under Jimbo Fisher. I'd feel better about them if Clemson's bananas offense wasn't in the same conference (Tigers are 15/2), and if FSU were a little more experienced. Redshirt freshman quarterback Deondre Francois actually doesn't bother me (remember Jameis Winston's redshirt freshman season? ), but this defense is littered with underclassman talent. Yes, most of them, like sophomore corner Tavares McFadden, are uber talents, but am I going to rely on a defense that only starts two seniors to shut down Deshaun Watson? At 12/1 yes, at 8/1, no. As things currently sit, you have to like Oklahoma at 12/1. The Sooners play in, potentially, the weakest Power 5 conference, where Texas is down, TCU is re-loading and Baylor is in shambles after a scandal-laden offseason. If OU gets past a very good Houston team Saturday, I would expect them to end up more in the 10/1 range by Monday, but buy now because the Sooners still host Ohio State and need to travel to TCU. Oklahoma who wouldn't even have to win a conference championship game to make the playoff, but would they get in with a loss? This year, I think they can afford one, especially if it's against Ohio State or on the road against a ranked opponent, but get the best odds you can right now on OU. Even with the Ohio State game, they still seem primed to make the playoff. And that's really the point, you can't win the playoff if you don't make it. Yes, I like Ohio State and Michigan as teams, but each of them pays out less than Oklahoma, and the odds of both of them making the playoff are pretty low. LSU, with 8 starters returning on both sides of the ball, including Mack Truck running back Leonard Fournette, would be an intriguing bet, if they weren't in the same division as Alabama, Ole Miss and Texas A&M. If you took Tennessee at 15/1 and watched them play Appalachian State Thursday night, well, I'm sorry to hear that. My picks: I grabbed the Noles at 12/1 a while back, but I don't like them at 8/1. I also grabbed Oklahoma at 12/1, where they still currently sit, and I hedged all that with a bet on Alabama at 7/1 (the Tide are now an 11/2 play) because, let's face it, they're probably gonna win it all again. If you're looking for a bet a little off the beaten path, check out Georgia at 35/1. Yes, they're in the SEC, but it's the SEC East, home of Gators, Vols and Gamecocks, not the brutal West where Nick Saban and Les Miles are duking it out. The Dawgs avoid both Alabama and LSU in their divisional crossover games, and get key games against Tennessee and Auburn at home. If new coach Kirby Smart can improve the defense, he has a killer running game led by the 1-2 punch of Nick Chubb and Sony Michel, and will start an experienced quarterback in Greyson Lambert for the kickoff game against North Carolina in the Georgia Dome. Looking at the schedule, the game against Florida in Jacksonville is never easy, but Florida loses a ton on defense and hasn't had an offense since that guy named Tebow left town, and a late September trip to Ole Miss seems to be the toughest game on the slate. You could do worse at 35/1 than a team that seems poised to win the SEC East with a potentially game-changing defensive coach. The Heisman is essentially a quarterback award, unless you're a bruising back from Alabama during a Crimson Tide title run. Since 2000, 13 quarterbacks have won the Heisman, compared to just three running backs, and two of those backs played for Bama, while the other (Reggie Bush) had to give his trophy back. It's practically a rule at this point that if you aren't a Nick Saban running back, you have to be a quarterback. Don't be mad at me, I don't make the rules, I just follow them. With that knowledge, you might be interested to know that three of the four Vegas favorites to win the Heisman are running backs, and none of them currently call Tuscaloosa home. While each is an intriguing pick individually (Fournette at 4/1, Stanford's Christian McCaffrey at 11/2 and FSU's Cook at 15/2), you have to know that the winner will PROBABLY be a quarterback. That makes Clemson's Deshaun Watson at 4/1 the true favorite for the award, and given all the pieces returning around him on that offense, I'd say that's fair. Also, the standard for winning the Heisman as a quarterback is just lower than any other position. When Mark Ingram, Reggie Bush and Derrick Henry all won their trophies, each was playing for a team about to play for a national championship (or, in Henry's case, enter the four-team playoff). A quarterback doesn't need to be on an elite team to win the Heisman, especially lately where Robert Griffin III, Johnny Manziel, Tim Tebow all won the award in years their teams didn't even qualify for BCS Bowl games. So, basically, bet a quarterback and use Watson, the proven stat machine and winner, as a hedge at 4/1. After him it's kind of a crap shoot though, because you never know which redshirt freshman or first-year starting sophomore will come out of nowhere to set the world on fire. Tebow, Manziel and Jameis Winston all being recent examples of this phenomenon. Good luck, because I'm not touching this one. Here are my picks for all of the games involving ranked teams, and a select few others. Home teams in CAPS. Love me some Christian McCaffrey, but I know better than to sleep on coach Bill Snyder and the Wildcats. Inexperience and injuries limited KSU last year, and I don't think they'll actually pull off the upset, but I don't see this devolving into a blowout either. With a ton of talent returning on defense, and a (hopefully) improved and healthier offense, look for BC to hang in there with anybody. Linebackers Connor Strachan and Matt Milano will be key to shutting down GT's option game, and I'd expect them to do so. I'll take the Boilermakers in a pick'em! I know I just took Oklahoma as a national title pick, but the Cougars return one of the best dual-threat quarterbacks in the nation in senior Greg Ward. I still like the Sooners, but asking them to win by two touchdowns seems like a little much against this offense. Urban Meyer shows no mercy! I mean, I know Michigan is gonna be real good in Jim Harbaugh's second season, but I've already seen Hawaii play, and they can actually move the ball a little bit. Granted, they did so in Australia against Cal, but the Rainbow Warriors still put up 31 points last week. Given Michigan's much stronger D, let's say that translates to 10-13 Hawaii points in The Big House Saturday. Are you taking Michigan to score 51-54? I'm not. Rutgers is bad, yo. I mean, not as bad as their marketing department, which thought this was a good idea, but still pretty bad. All hail the SEC West and all, but I'll take the ranked team and the points against one of the division's more inconsistent teams. This has the feel of one of those games where LSU blows out Wisconsin, building its national profile, and then we find out a few weeks later that Wisconsin just isn't very good. I can't be the only one thinking this. Last year's Hawkeye squad was unexpectedly good offensively, and really just a charmed team in general. Do I expect Iowa to re-create last season's magic? Absolutely not, and part of that means a return to the boring Kirk Ferentz offenses of years past. That means I can't trust this team to score 28 points consistently against anybody. This is basically a home game for the Dawgs, who should be much improved on defense, and still able to pound the rock on offense. Oh, and I have this theory that North Carolina is overrated every year. I could look into their preseason poll positions from the last few seasons to validate my point, but who has the time for that. Again, do we really think highly enough of Florida's offense for the line to be this inflated? The Gators scored over 36 points only twice all of last season, and never scored more than 28 after losing quarterback Will Grier to a PED suspension. In fact, the Gators were held to single digits three times in their final six games without Grier. Now you're expecting me to give 37 with this offense? That whole thing about LSU crushing Wisconsin, then us finding out that Wisconsin isn't actually any good a few weeks later… Yeah, same thing here, only Nick Saban will take great pleasuring in burying one of college football's premier programs in front of the whole country. Auburn is a trendy pick to come out of nowhere and win it all, mostly because they've already done that once this decade, and nearly did it again in 2013. I'm not buying it, but I am buying Clemson's offensive firepower. The rebuilt Clemson defense, especially up front, will be the biggest question mark, but if this devolves into a shootout, I'll go with the nation's best gun slinger, Clemson quarterback Deshaun Watson. I'll take Okie State and Oregon. Shocker, I know. This young FSU defense makes its first statement of the season, shutting down Chad Kelly and a pretty good Ole Miss offense, en route to a double-digit home victory. The national title hype machine then gets going in Tallahassee.